Mesa sideline on Saturday night. 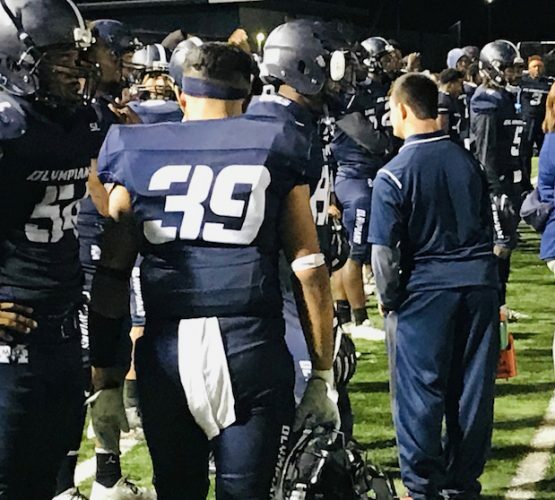 SAN DIEGO – The El Camino Warriors scored two touchdowns in the final 3:22, including an 18-yard scoring pass with 14 seconds left to defeat host San Diego Mesa in a National Central League opener on Saturday night. The Olympians did some rallying of their own in the fourth quarter, erasing a six-point deficit with a pair of scores. DEJON SMITH caught a 7-yard touchdown pass from JAKE DUNNINWAY, then Dunninway rushed for a 17-yard TD to put Mesa up 44-36 with 8:19 to go in the game. Smith scored on a 36-yard pass from Dunninway early in the second quarter to give Mesa (3-3) a 14-0 lead. Mesa kicker JUSTIN KAPLAN hit a 31-yard field goal with 4:46 to go in the second quarter as the hosts led 16-7 at the half in a reasonable scoring contest. Then things broke loose in the second half. Dunninway had a 36-yard scoring pass to AUSTIN RUMBO to put Mesa ahead 23-14 early in the third after the Warriors scored on their first possession of the second half. The Olympians pretty much wore out their turnover trashcan again on the sidelines with five interceptions, including one that resulted in a 75-yard touchdown by BRENDAN TORRANCE that gave Mesa a 30-21 edge. El Camino (4-2) erased that lead and grabbed an edge for the first time with two quick scores late in the third quarter. The Warriors turned the nine-point deficit into a six-point lead in just 2:15. After Jonah Tavai tied the game for ECC with his second touchdown with 3:22 remaining, Trevon Clark caught an 18-yard touchdown pass from Aaron Tomas with 14 seconds left. Dunninway finished with 464 yards passing on 30-of-44 attempts and four touchdowns, although ECC out-gained the Olympians 546-498. The game had 31 penalties for 275 yards combined. Smith caught 10 passes for 162 yards, while DOMINIC MCMANUS had seven receptions for 120 yards. KEVIN LEVESQUE scored the only touchdown of the first quarter on a reception. Former Mount Miguel Matador SANTINO PACHECO got his interception slammed into the receptacle, while AVEON IRVING had two of the five picks. Mesa faces Cerritos College next on the road. 1 02:34 San Diego Mesa – Kevin Levesque 25 yd pass from Jake Dunninway. (Justin Kaplan kick is good). 2 13:07 San Diego Mesa – Dejon Smith 36 yd pass from Jake Dunninway. (Justin Kaplan kick failed). 2 08:12 El Camino – Kishawn Berry 19 yd pass from Grant Ferrauilo. (Chris Valle kick is good). 2 04:46 San Diego Mesa – Justin Kaplan 31 yd field goal. 3 09:46 San Diego Mesa – Austin Rumbo 36 yd pass from Jake Dunninway. (Justin Kaplan kick is good). 3 07:11 El Camino – Kishawn Berry 10 yd pass from Grant Ferrauilo. (Chris Valle kick is good). 3 05:31 San Diego Mesa – Brendan Torranc 75 yd interception return. (Justin Kaplan kick is good).